It's no secret that amethyst is my favorite birthstone, but August's peridot gem shines close. Pam of Vintage ShowOff mined some stunning stones during my shop's last Treasury Island spotlight attack. Her August birthday gift ideas include sterling silver LEGO flower ring by rubygirl, genuine peridot briolette necklace by Anna M Jewelry and my green dragon magnet. I made a cool bracelet treasury, I was also featured in one. I'm not able to put a second entry above. I'll go out, and come back in to try. in case it does not work. Always fun to be here - so glad you love peridot - I love green too! Love the color combo of today's featured treasury! I actually got into a treasury twice after so many weeks without any! So happy! Off to check out the others! Beautiful treasury. I have some old stock peridot that I need to make up. Great inspiration. 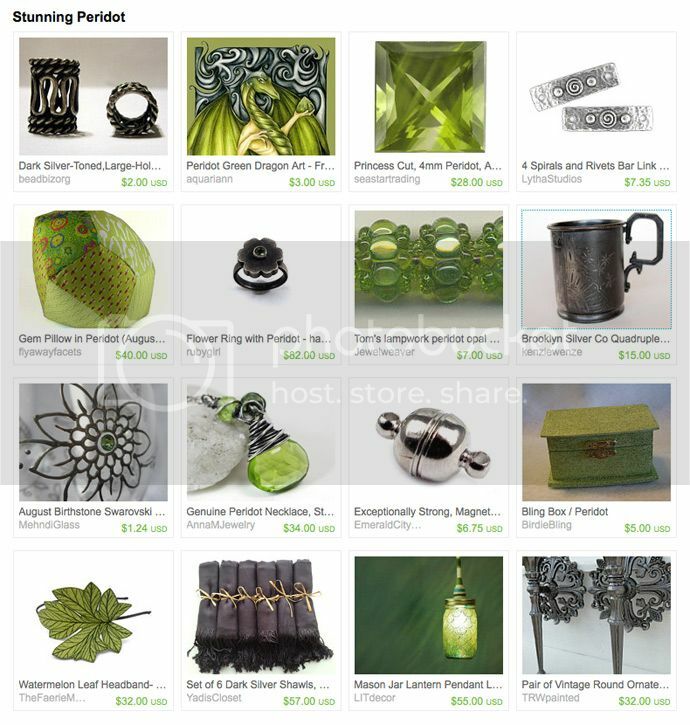 Love this fab green treasury!